McGregor appears in a video for Reebok, talking about superstitions. I think superstitions, for me personally, is just another word for fear. You need to wear your lucky pants, and then all of the sudden, your lucky pants aren’t there and then you start freaking out. It’s simply fear in another word…I can do anything, I can eat anything, I can wear anything. I am confident that I can enter the fight without needing anything artificial. 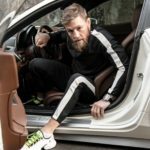 McGregor uploads a photo of the limited edition Reebok Furylites to Instagram. The shoes are in green plaid with orange accents.